“Did you go with anyone?” she asked. I was at a Camino talk hosted by our local chapter of American Pilgrims on the Camino. Future pilgrims come not just to hear the presentation, but to ask their questions to those of us that have been there. “No, I went alone,” I told her. I lay on the chaise lounge of my screened-in porch reading a book while waiting for my friend Amanda to pick me up. We were headed to a fashion show and I was clad in jeans and sandals. The only “fashionable” thing I donned was a silky spaghetti strap top. I wondered if it was enough. Amanda arrived dressed in her business casual. We drove the two miles into town, parked and started our walk toward the venue, my feet reminding me that the shoes I wore are a pair I consider “sitting shoes”: they’re not ideal for walking down bricked sidewalks, or for walking period. As we walked down Broadway, a car pulled up beside us. The driver, a guy in his thirties with tousled hair, said, “Excuse me. Do you know of anyplace around here to get fresh vegetable juice?” Pause here just a moment. Take in the scene. A man. My age. Asking where he can get vegetable juice. I’m sure there are other places on this earth where this might happen, but I have never lived in one. I racked my brain. I’d seen places around town whose menus included home-made concoctions like this, but none came to mind. “Maybe Rosetta’s–all their food is vegan,” said Amanda. “And if they don’t have it, they’ll know someplace that does,” I added. With that, we sent him off. Upon entering the fashion show I was floored by how many women donned dresses and heels. I’d never seen so many well dressed Ashevillians in one place. Those of you that know me may wonder what possessed me to attend a fashion show–me, the girl who rarely shops and, if she does, does so in consignment stores. Well, this wasn’t just any fashion show. It was a benefit for the Asheville Community Theater. In true Asheville style, the four categories were: paper, light, nature, and upcycled/recycled. Mind you, I’d never heard the word “upcycled” until I moved to Asheville. There’s an entire shop here dedicated to such things: items made from something else. Purses made of old seat belts caught my eye last I stopped in there. The winner in the upcycled/recycled category was 11-year-old Luc Clerici, who fashioned a dress out of labels from plastic water bottles and Campbell’s soup cans. In the nature category? A dress made with plenty of fresh flowers all of which I imagined would be composted after the show. Composting is the norm here, after all. After the show, we chatted with friends as designers walked by carrying their fashions to their cars: outfits crafted from playing cards, DVD covers, and socks. The night wound down and Amanda and I headed back to the car. And I made a mental note to find out who in town makes vegetable juice, because I’m sure it’s not the last time I’ll be asked that question. I lay in bed listening to the rain. The brook outside my bedroom door, normally babbling, was now a loud roar. I remember when weather like this darkened my spirits — when weather like this presented me with a good excuse to curl up in bed and read for a few hours. Or the entire day. There was a time I was sure I’d never like rainy days. But that was before I started training for the Camino. I’d done this once before: hooked myself up to ropes and carabiners and attempted to scale an indoor rock climbing wall. After that first class I thought perhaps I’d do it again–not for exercise mind you, but for the sculpted arms and flat stomach I’d always dreamed of. Unfortunately, rock climbing requires two people. And I had nary a soul to join me. Fast forward ten plus years. My friend Ben, who goes on a regular basis, tells me it would be a great way to meet men. This peaks my interest, as it would any warm-blooded, single, thirty-something heterosexual woman. “I have no arm strength,” I tell him. “Doesn’t matter–you use your legs.” I know for a fact that one can’t climb a wall without the use of ones arms. “Your arms just to hold you to the wall. You don’t pull yourself up with your arms, you push yourself up with your legs.” This was all starting to come back to me. The arms don’t get sculpted because you’re pulling your entire body weight up with them; they get sculpted because your using them to hold on for dear life. But that’s where the ropes come in. As long as you trust the person you’re climbing with, falling off the wall is not a problem. Your partner, through some easy moves with the ropes around his own waist (which are the same ones attached to you), can stop you mid-air and lower you gently. So last Tuesday night, I planned to meet three friends at the indoor rock-climbing place downtown. I signed the paper that outlined the various ways I could be injured or killed. “My boss would be thrilled you actually read it before you signed it,” the guy behind the desk told me. Maybe I shouldn’t have. I was the first to show up and while looking around I noticed something odd: no one was using ropes. I recalled Katie, who would be joining me that night, telling me her least favorite part was falling off the wall. At the time, I was a bit mystified. “I don’t have a problem with that as long as I trust the person spotting me,” I said. I didn’t realize we were talking about two different experiences. The image in my mind included ropes and a person that kept me from free-falling. Her image, I now realized, did not. Unlike my skydiving adventure, I didn’t have the time to shoot out e-mails to my family telling them how much I loved them. So I guessed I’d just have to survive. My three friends showed up and Ben dutifully explained how the place worked. Double arrows next to a “rock” indicated it was the one on which I would place both my hands to start. Then, I’d follow the color-coded arrows up the wall to the red line. “You can’t climb higher than the red line without ropes.” Regardless, that red line was entirely too far above my head for my comfort. After a few tries, I made it up to the red line. “Now what?” I asked Ben. “Uhhh. . . no,” I said, my arms clinging to the wall. I started climbing back down the way I came up, and jumped when I was just a few feet off the ground. I am, after all, the girl that to this day, when I go play on swing sets, does not feel comfortable jumping off until the swing has nearly stopped. “But you jumped out of a plane!” you might say. Well, yes. Yes, I did. But there was a large Russian man strapped to my back. And in his control was not one, but two parachutes. And we had a good few minutes to get them up before we hit the ground. At one point Ben pointed out some of the men of which he had spoken: glistening chiseled arms, six-pack abs. “That’s what this place does for you,” he said. That’s what this place does for THEM, I thought. Me? I’m going back to banking on my good looks and sparkling personality. 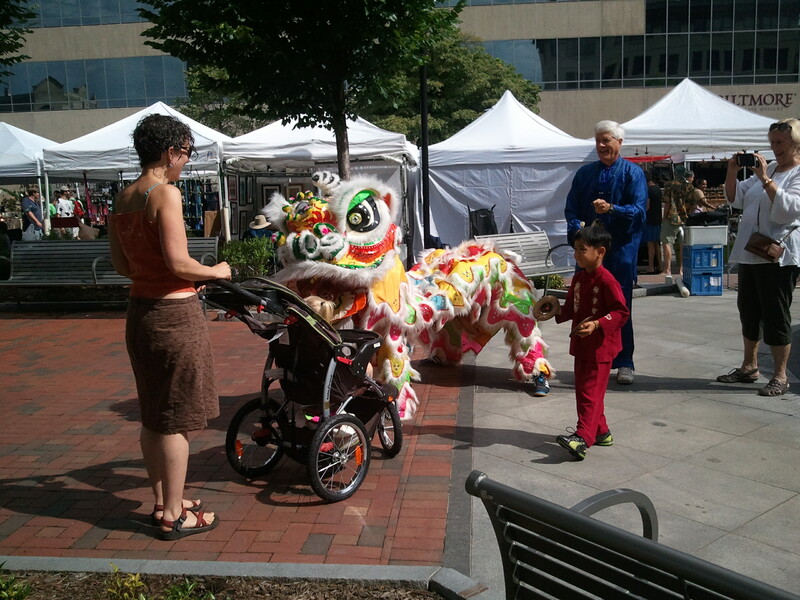 When I set out that morning, I didn’t expect my day would include a Chinese dragon looking up my skirt. But this is Asheville. One day, such things will come as no surprise at all. The idea, from Julia Cameron’s The Artist’s Way, is to have a weekly date with yourself. It had been months since I had deliberately made such plans, but when I found myself with a completely free weekend I figured I was long overdue. I walked to town to check out “Stories from Asheville’s Front Porch.” Now if that doesn’t sound relaxing, you’re entirely too busy. Stories? Porches? What’s not to love? As I walked through Pack Square on my way to the performance I saw artists unpacking boxes and putting up tents, setting out tables to display their wares. For what, I wasn’t sure, but now I knew what I’d do after the storytelling. I crossed the street and that’s when the ruckus began. A gong being struck over and over, cymbals sounding, and a multi-colored Chinese Dragon weaving among the tents. I stood to watch, then took out my camera. At the end of the video, you’ll see that I lose focus, the camera staring not at the dragon, but at the sqaure. That was when the dragon attempted to look up my skirt. I, at first, was a little flustered that he was getting so close to me, and once I realized what he was doing, I stepped away, letting out a surprised laugh, at one point catching the eye of the guy inside who was responsible for maneuvering the dragon’s head. After shutting off my camera, I walked quickly toward my intended destination. I didn’t know what to make of the whole thing. I suppose, when in costume, men do things they wouldn’t do otherwise? As I walked, I realized the dragon following me. It clicked just then that he was part of the storytelling event to which I was headed–as opposed to a very unusual stalker. I saw the men come out of their costume for a rest before the event started and I got the feeling the front runner of the duo was a bit embarrassed by his actions–not thinking he’d actually see me again, and not looking like the type who would normally attempt to look up women’s skirts. And all of this was before my artist date even officially started. It was going to be an interesting day.